Expectorant to moisten and clear the lung and upper respiratory ducts and maintain healthy lung and bronchial functions. 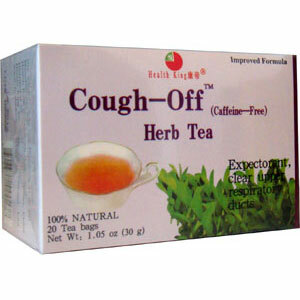 Cough-Off Herb Tea (Caffeine-Free), is made of wild platycodon root and loquat leaf (eriobotryae folium). They provide saponin, sitosterol, platycodigenin, eriocitrin, polygalacic acid, oleanolic acid, ursolic acid, amygadalin, vitamin B, etc. Traditional Chinese medicine uses them as expectorant to moisten and clear the lung and upper respiratory ducts and maintain healthy lung and bronchial functions.